We really got into the Olympics this year. More than any other Olympic Games in the past ten years, this one has had us intrigued. 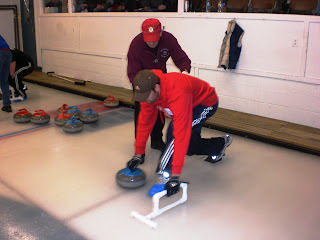 We learned a great deal about many sports (in fact, I went and did a post about them on my other blog), and got into curling a little bit. It was a sport that I previously thought was like hockey, only with brooms and rocks. I didn't even realize it was played on ice. Oops. Okay, here's the quick rundown for those who might not know anything about curling... it's an Olympic sport that originated in Scotland well over a hundred years ago. Each team has 8 stones (granite, 42 pounds, concave bottom, handle on top) and they take turns going, and you have 10 ends (similar to innings) to get yours in the house (target). The house is round, 12 feet in diameter. The middle 2 feet are called the button, and after both teams have thrown their stones, the stone closest to the middle indicates the team that will receive points that end. For each stone they have closer to the button than the opponent's closest stone, you get that many points. Whoever has the most points after the 10th end wins. If it's a tie, you have an 11th end. There are 4 people on a team... one throws, one stands at the house and yells if they're going too fast, too slow, if they're straight, etc., and 2 sweepers (although all 4 players can sweep). The ice is covered in little droplets that cause the stone to spin/curl slightly (like those mini-shuffleboard courts), so the sweepers make the stone move quicker and straighter. I think that covers the basics. It's quite strategic, and is considered "chess on ice." 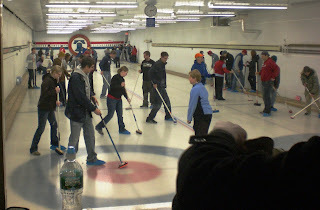 Now, I decided it would be fun to try curling, so I looked up where a local curling club would be (you can search here), and found out there was one 45 minutes away, outside Philadelphia. I found out they were having an open house opportunity to try it out, and immediately resolved that the following weekend I would be trying my hand at delivering the stone. Jonathan had a racquetball game on Saturday morning, so he wasn't able to come with me. I hit only a little traffic on the way to Paoli, but spent quite a bit of time trying to find parking. 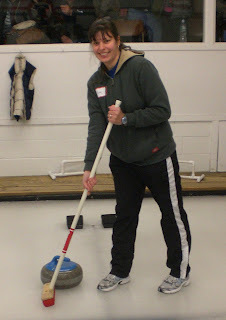 Apparently, every other person in the area also became a curling fan this season, and wanted in on a free lesson. I finally resorted to parking at a bank a few blocks away, and kept my fingers crossed they wouldn't tow/ticket (and they didn't). 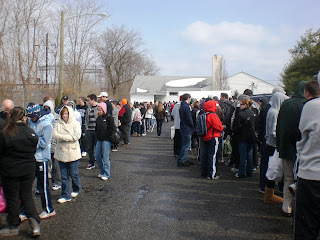 this is halfway through the line... to the right are in front of me, to the left is behind me. While I waited in line, there were several members of the curling club walking around and answering questions, so I got the history of the club, history of the sport, the evolution of the brooms, how the stones are made and maintained, and several personal histories of how people came to the sport. I also got to pick up a stone (heavy! ), feel some brushes (both weight and texture), and got a good explanation of how the shoes work (one foot has a slippery teflon surface so you can glide on the ice). Once inside, we filled out waivers, gave our $5 donations to build a wheelchair ramp, and heard about the opportunities to take lessons and eventually join the club. 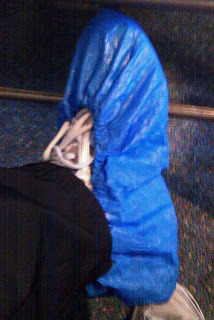 Then, we were given blue booties to put on our sliding feet (left for me, and most other right-handed people) and put into groups of ten while we watched those ahead of us practice on the two sheets below. Then, when my group got to go, we were led out onto the ice and told to grab a broom. We learned how to get on and off the ice, and then practiced pushing off of a wooden ledge. The instructor made individual suggestions, so that was nice. After 5-6 tries, we were each given a chance to push off of the hack, and we had a PVC contraption for balance. Next, we each had the opportunity to practice throwing a curling stone. There's quite a bit of strategy to it, but our goal was pretty basic: push off, move the stone, release the stone, don't fall over. I had problems moving my stone, since it freezes to the spot if it doesn't move. So you actually have to pull it backward a tiny bit before you move forward. Last, we learned about sweeping. This part was kinda lost unto me, since I was the fifth person from the stone, so I didn't feel like I was actually affecting the stone's path. But, the sweeping is kinda a dealbreaker for me. I'm not excited about continuing my participation in the sport because of how difficult it is to sweep that fast. I don't have the arms for it, LoL. We were given the opportunity to have our photos taken before we left the ice, and about four of us took the chance. Overall, it was a very interesting experience, and I would consider doing it again, but probably only another open house... I don't think I'm serious enough to fork over $100 for eight hours of lessons. But, maybe wherever we live next will have a closer club and a less expensive rate... who knows.